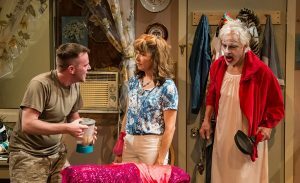 Playwright Taylor Mac has described Hir as “a kitchen-sink drama.” Which is fair, as long as you understand that the sink in question is full of filthy dishes and fresh vomit. The genre- and gender-bending play, at Shakespeare & Company through October 7, begins with a homecoming and ends with an expulsion. In between, it tackles themes of gender and identity, power and privilege, dysfunction and abuse, love and hate – and one of the most compelling things about it is the ways in which those categories overlap and converge. The returnee is Isaac, a Marine arriving home from a war zone where his job was picking up body parts from the battlefield. 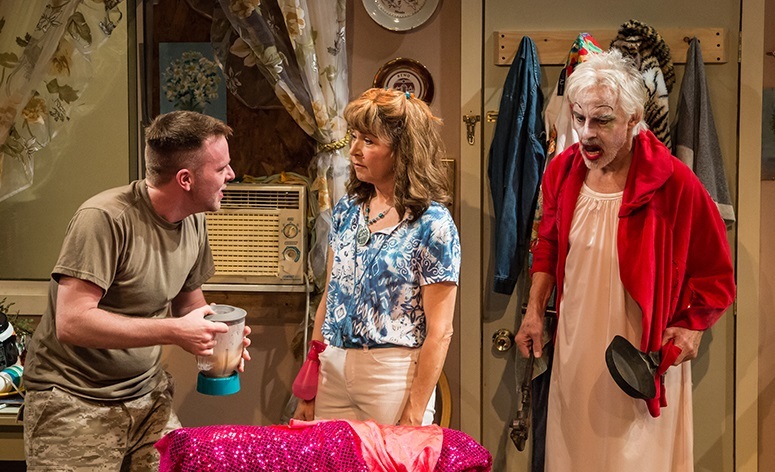 He arrives to find his father has had a debilitating stroke and now wears diapers and clown makeup, his mother has become “a bit eccentric, but not insane,” and his sister is now his brother. Mac also calls the piece “absurd realism,” an apt designation, as it careens through wacky comedy to bruising conflict and back again. I’d call it a roller-coaster ride, but it soon jumps the tracks into its own surreal groove. When Isaac opens the front door, his first line is a horrified scream. His home, a tacky suburban ranch house, is littered with junk and dirty clothes – “like a bomb had hit Goodwill,” he gasps. His mother, Paige, freed from her husband’s patriarchal tyranny, is celebrating her liberation by subverting all conventional values, from housekeeping to gender identity. She enthusiastically endorses the transition of her younger child, Max, from female to male, and instructs Isaac in the proper use of pronouns: “You must use ze instead of he or she and you must use hir in place of her or him” (thus the play’s title, pronounced “here,” perhaps also signaling its inescapable physical and emotional terrain). Max hirself is a cocktail of hormones, both adolescent and pharma. Jack Doyle nails Max’s teenage arrogance and insolence, but plays the part more like a gay boy than a transitioning F-to-M.
Adam Huff is persuasive as straight-arrow Isaac, disgusted and alarmed by the chaos, which triggers his PTSD (the puke in the sink is his). 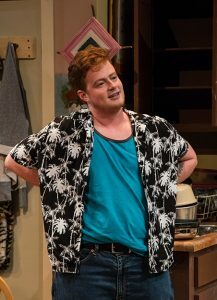 The playwright has referred to “the prodigal son” theme in the piece, but the mythic analogue here seems closer to Isaac’s biblical namesake, sacrificed on the altar of a parent’s vision. As Arnold, John Hadden has few lines, almost all monosyllables, but his body language and animated expression tell the full story of the man’s pain, resentment and residual pride. 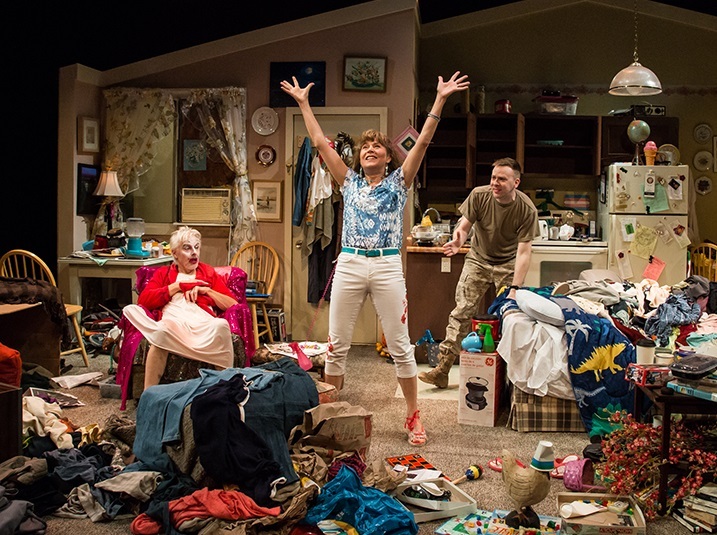 Director Alice Reagan keeps things going at a breathless pace, with the trashy, trashed set by Carolyn Mraz (part of an all-female design team) serving as both a metaphor of creative destruction and an obstacle course for the actors’ madcap trajectories. A watchword for our time.